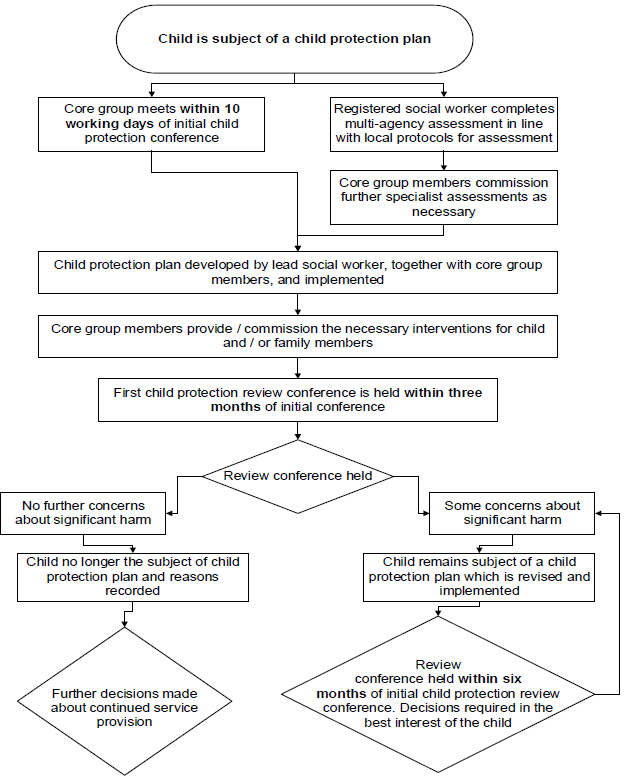 Flow chart 5: What happens after the child protection conference, including the review? Providing early help is more effective in promoting the welfare of children than reacting later. Early help means providing support as soon as a problem emerges, at any point in a child?s life, from the foundation years through to the teenage years. Early help can also prevent further problems arising; for example, if it is provided as part of a support plan where a child has returned home to their family from care, or in families where there are emerging parental mental health issues or drug and alcohol misuse. Provide targeted early help services to address the assessed needs of a child and their family which focuses on activity to improve the outcomes for the child. Local authorities, under section 10 of the Children Act 2004, have a responsibility to promote inter-agency co-operation to improve the welfare of all children. Section 10 of the Children Act 2004 requires each local authority to make arrangements to promote co- operation between the authority, each of the authority?s relevant partners and such other persons or bodies working with children in the local authority?s area as the authority considers appropriate. Local organisations and agencies should have in place effective ways to identify emerging problems and potential unmet needs of individual children and families. Local authorities should work with organisations and agencies to develop joined-up early help services based on a clear understanding of local needs. This requires all practitioners, including those in universal services and those providing services to adults with children, to understand their role in identifying emerging problems and to share information with other practitioners to support early identification and assessment. Multi-agency training will be important in supporting this collective understanding of local need. Practitioners working in both universal services and specialist services have a responsibility to identify the symptoms and triggers of abuse and neglect, to share that information and provide children with the help they need. To be effective, practitioners need to continue to develop their knowledge and skills in this area and be aware of the new and emerging threats, including online abuse, grooming, sexual exploitation and radicalisation. To enable this, the three safeguarding partners should consider what training is needed locally and how they will monitor and evaluate the effectiveness of any training they commission. Private fostering occurs when a child under the age of 16 (under 18, if disabled) is provided with care and accommodation by a person who is not a parent, person with parental responsibility for them or a relative in their own home. A child is not privately fostered if the person caring for and accommodating them has done so for less than 28 days and does not intend to do so for longer. Children and families may need support from a wide range of local organisations and agencies. Where a child and family would benefit from co-ordinated support from more than one organisation or agency (e.g. education, health, housing, police) there should be an inter-agency assessment. These early help assessments should be evidence-based, be clear about the action to be taken and services to be provided and identify what help the child and family require to prevent needs escalating to a point where intervention would be needed through a statutory assessment under the Children Act 1989. A lead practitioner should undertake the assessment, provide help to the child and family, act as an advocate on their behalf and co-ordinate the delivery of support services. A GP, family support worker, school nurse, teacher, health visitor and/or special educational needs co-ordinator could undertake the lead practitioner role. Decisions about who should be the lead practitioner should be taken on a case-by-case basis and should be informed by the child and their family. Practitioners should be able to discuss concerns they may have about a child and family with a social worker in the local authority. Local authority children?s social care should set out the process for how this will happen. In cases where consent is not given for an early help assessment, practitioners should consider how the needs of the child might be met. If at any time it is considered that the child may be a child in need, as defined in the Children Act 1989, or that the child has suffered significant harm or is likely to do so, a referral should be made immediately to local authority children?s social care. This referral can be made by any practitioner. The provision of early help services should form part of a continuum of support to respond to the different levels of need of individual children and families. Local areas should have a comprehensive range of effective, evidence-based services in place to address assessed needs early. The early help on offer should draw upon any local assessment of need, including the JSNA and the latest evidence of the effectiveness of early help programmes. In addition to high quality support in universal services, specific local early help services will typically include family and parenting programmes, assistance with health issues, including mental health, responses to emerging thematic concerns in extra-familial contexts, and help for emerging problems relating to domestic abuse, drug or alcohol misuse by an adult or a child. Services may also focus on improving family functioning and building the family?s own capability to solve problems. This should be done within a structured, evidence-based framework involving regular review to ensure that real progress is being made. Some of these services may be delivered to parents but should always be evaluated to demonstrate the impact they are having on the outcomes for the child. Where a child?s need is relatively low level, individual services and universal services may be able to take swift action. Where there are more complex needs, help may be provided under Section 17 of the Children Act 1989 (children in need). Where there are child protection concerns (reasonable cause to suspect a child is suffering or likely to suffer significant harm) local authority social care services must make enquiries and decide if any action must be taken under Section 47 of the Children Act 1989. It is important that there are clear criteria amongst all organisations and agencies working with children and families for taking action and providing help across this full continuum to ensure that services are commissioned effectively and that the right help is given to the child at the right time. In making their local arrangements, the safeguarding partners should agree with their relevant agencies the levels for the different types of assessment and services to be commissioned and delivered. This should include services for children who have suffered or are likely to suffer abuse and neglect whether from within the family or from external threats. This should also include services for disabled children and be aligned with the short breaks services statement. Section 20 of the Children Act 1989 (duty to accommodate a child). Guidance on specific safeguarding concerns can be found in Appendix B. Required under the Breaks for Carers of Disabled Children Regulations 2011. Anyone who has concerns about a child?s welfare should make a referral to local authority children?s social care and should do so immediately if there is a concern that the child is suffering significant harm or is likely to do so. Practitioners who make a referral should always follow up their concerns if they are not satisfied with the response. Local authority children?s social care has the responsibility for clarifying the process for referrals. This includes specific arrangements for referrals in areas where there are secure youth establishments. Within local authorities, children?s social care should act as the principal point of contact for safeguarding concerns relating to children. As well as protocols for practitioners working with children and families, contact details should be signposted clearly so that children, parents and other family members are aware of who they can contact if they wish to make a referral, require advice and/or support. When practitioners refer a child, they should include any information they have on the child?s developmental needs, the capacity of the child?s parents or carers to meet those needs and any external factors that may be undermining their capacity to parent. This information may be included in any assessment, including an early help assessment, which may have been carried out prior to a referral into local authority children?s social care. Where an early help assessment has already been undertaken, it should be used to support a referral to local authority children?s social care; however, this is not a prerequisite for making a referral. If practitioners have concerns that a child may be a potential victim of modern slavery or human trafficking then a referral should be made to the National Referral Mechanism, as soon as possible. Feedback should be given by local authority children?s social care to the referrer on the decisions taken. Where appropriate, this feedback should include the reasons why a case may not meet the statutory threshold and offer suggestions for other sources of more suitable support. Practitioners should always follow up their concerns if they are not satisfied with the local authority children?s social care response and should escalate their concerns if they remain dissatisfied. Effective sharing of information between practitioners (see Information sharing advice for safeguarding practitioners) and local organisations and agencies is essential for early identification of need, assessment and service provision to keep children safe. Serious case reviews (SCRs) have highlighted that missed opportunities to record, understand the significance of and share information in a timely manner can have severe consequences for the safety and welfare of children. Practitioners should be proactive in sharing information as early as possible to help identify, assess and respond to risks or concerns about the safety and welfare of children, whether this is when problems are first emerging, or where a child is already known to local authority children?s social care (e.g. they are being supported as a child in need or have a child protection plan). Practitioners should be alert to sharing important information about any adults with whom that child has contact, which may impact the child?s safety or welfare. Information sharing is also essential for the identification of patterns of behaviour when a child has gone missing, when multiple children appear associated to the same context or locations of risk, or in relation to children in the secure estate where there may be multiple local authorities involved in a child?s care. It will be for local safeguarding partners to consider how they will build positive relationships with other local areas to ensure that relevant information is shared in a timely and proportionate way. Where practitioners need to share special category personal data, they should be aware that the Data Protection Act 2018 contains ?safeguarding of children and individuals at risk? as a processing condition that allows practitioners to share information. This includes allowing practitioners to share information without consent, if it is not possible to gain consent, it cannot be reasonably expected that a practitioner gains consent, or if to gain consent would place a child at risk. No ? the Data Protection Act 2018 and GDPR do not prohibit the collection and sharing of personal information, but rather provide a framework to ensure that personal information is shared appropriately. In particular, the Data Protection Act 2018 balances the rights of the information subject (the individual whom the information is about) and the possible need to share information about them. No ? you do not necessarily need consent to share personal information. Wherever possible, you should seek consent and be open and honest with the individual from the outset as to why, what, how and with whom, their information will be shared. You should seek consent where an individual may not expect their information to be passed on. When you gain consent to share information, it must be explicit, and freely given. There may be some circumstances where it is not appropriate to seek consent, because the individual cannot give consent, or it is not reasonable to obtain consent, or because to gain consent would put a child?s or young person?s safety at risk. No ? this is not the case, unless the information is to be used for a purpose incompatible with the purpose for which it was originally collected. In the case of children in need, or children at risk of significant harm, it is difficult to foresee circumstances where information law would be a barrier to sharing personal information with other practitioners. No ? this is not the case. In addition to the Data Protection Act 2018 and GDPR, practitioners need to balance the common law duty of confidence and the Human Rights Act 1998 against the effect on individuals or others of not sharing the information. No ? IT systems, such as the Child Protection Information Sharing project (CP-IS), can be useful for information sharing. IT systems are most valuable when practitioners use the shared data to make more informed decisions about how to support and safeguard a child. Practitioners looking to share information should consider which processing condition in the Data Protection Act 2018 is most appropriate for use in the particular circumstances of the case. This may be the safeguarding processing condition or another relevant provision. There may be a need for immediate protection whilst an assessment or enquiries are carried out. When undertaking an assessment of a disabled child, the local authority must also consider whether it is necessary to provide support under section 2 of the Chronically Sick and Disabled Persons Act (CSDPA) 1970. Where a local authority is satisfied that the identified services and assistance can be provided under section 2 of the CSDPA, and it is necessary in order to meet a disabled child?s needs, it must arrange to provide that support. Where a local authority is assessing the needs of a disabled child, a carer of that child may also require the local authority to undertake an assessment of their ability to provide, or to continue to provide, care for the child, under section 1 of the Carers (Recognition and Services) Act 1995. The local authority must take account of the results of any such assessment when deciding whether to provide services to the disabled child. If a local authority considers that a parent carer of a disabled child (see Appendix A: Glossary) may have support needs, it must carry out an assessment under Section 17ZD of the Children Act 1989. The local authority must also carry out such an assessment if a parent carer requests one. Such an assessment must consider whether it is appropriate for the parent carer to provide, or continue to provide, care for the disabled child, in light of the parent carer?s needs and wishes. Chronically Sick and Disabled Persons Act (CSDPA) 1970. If a local authority considers that a young carer (see Appendix A: Glossary) may have support needs, it must carry out an assessment under Section 17ZA of the Children Act 1989. The local authority must also carry out such an assessment if a young carer, or the parent of a young carer, requests one. Such an assessment must consider whether it is appropriate or excessive for the young carer to provide care for the person in question, in light of the young carer?s needs and wishes. The Young Carers? (Needs Assessment) Regulations 2015 require local authorities to look at the needs of the whole family when carrying out a young carer?s needs assessment. Young carers? assessments can be combined with assessments of adults in the household, with the agreement of the young carer and adults concerned. The Young Carers? (Need Assessment) Regulations 2015. Any assessment of children in secure youth establishments should take account of their specific needs. In all cases, the local authority in which a secure youth establishment is located is responsible for the safety and welfare of the children in that establishment. The host local authority should work with the governor, director, manager or principal of the secure youth establishment and the child?s home local authority, their relevant Youth Offending Team and, where appropriate, the Youth Custody Service to ensure that the child has a single, comprehensive support plan. Where a child becomes looked-after, as a result of being remanded to youth detention accommodation (YDA), the local authority must visit the child and assess the child?s needs before taking a decision. This information must be used to prepare a Detention Placement Plan (DPP), which must set out how the YDA and other practitioners will meet the child?s needs whilst the child remains remanded. The DPP must be reviewed in the same way as a care plan for any other looked-after child. Following the Legal Aid Sentencing and Punishment of Offenders Act 2012 all children and young people remanded by a court in criminal proceedings will be looked-after. As well as threats to the welfare of children from within their families, children may be vulnerable to abuse or exploitation from outside their families. These extra-familial threats might arise at school and other educational establishments, from within peer groups, or more widely from within the wider community and/or online. These threats can take a variety of different forms and children can be vulnerable to multiple threats, including: exploitation by criminal gangs and organised crime groups such as county lines; trafficking, online abuse; sexual exploitation and the influences of extremism leading to radicalisation. Extremist groups make use of the internet to radicalise and recruit and to promote extremist materials. Any potential harmful effects to individuals identified as vulnerable to extremist ideologies or being drawn into terrorism should also be considered. Assessments of children in such cases should consider whether wider environmental factors are present in a child?s life and are a threat to their safety and/or welfare. Children who may be alleged perpetrators should also be assessed to understand the impact of contextual issues on their safety and welfare. Interventions should focus on addressing these wider environmental factors, which are likely to be a threat to the safety and welfare of a number of different children who may or may not be known to local authority children?s social care. Assessments of children in such cases should consider the individual needs and vulnerabilities of each child. They should look at the parental capacity to support the child, including helping the parents and carers to understand any risks and support them to keep children safe and assess potential risk to child. Channel panels, established under the Counter-Terrorism and Security Act 2015, assess the extent to which identified individuals are vulnerable to being drawn into terrorism, and, where appropriate, arrange for support to be provided. When assessing Channel referrals, local authorities and their partners should consider how best to align these with assessments undertaken under the Children Act 1989. The Children Act 1989 promotes the view that all children and their parents should be considered as individuals and that family structures, culture, religion, ethnic origins and other characteristics should be respected. Local authorities should ensure they support and promote fundamental British values, of democracy, the rule of law, individual liberty, and mutual respect and tolerance of those with different faiths and beliefs. The Counter-Terrorism and Security Act 2015 contains a duty on specified authorities in England, Wales and Scotland to have due regard to the need to prevent people from being drawn into terrorism. Under the Counter-Terrorism and Security Act 2015. To provide support to address those needs to improve the child?s outcomes and welfare and where necessary to make them safe. Local authorities, with their partners, should develop and publish local protocols for assessment. A local protocol should set out clear arrangements for how cases will be managed once a child is referred into local authority children?s social care and be consistent with the requirements of this statutory guidance. The detail of each protocol will be led by the local authority in discussion and agreement with the safeguarding partners and relevant agencies where appropriate. The local authority is publicly accountable for this protocol and all organisations and agencies have a responsibility to understand their local protocol. The local protocol should reflect where assessments for some children will require particular care. This is especially so for young carers, children with special educational needs (including to inform and be informed by Education, Health and Care Plans), unborn children where there are concerns, children in hospital, children with specific communication needs, asylum seeking children, children considered at risk of gang activity and association with organised crime groups, children at risk of female genital mutilation, children who are in the youth justice system, and children returning home. Where a child has other assessments, it is important that these are co-ordinated so that the child does not become lost between the different organisational procedures. There should be clear procedures for how these organisations and agencies will communicate with the child and family, and the local protocol for assessment should clarify how organisations and agencies and practitioners undertaking assessments and providing services can make contributions. The local protocol for assessment should set out the process for challenge by children and families by publishing the complaints procedures. Including as specified under Section 26(3) of the Children Act 1989 and the Children Act 1989 Representations Procedure (England) Regulations 2006. 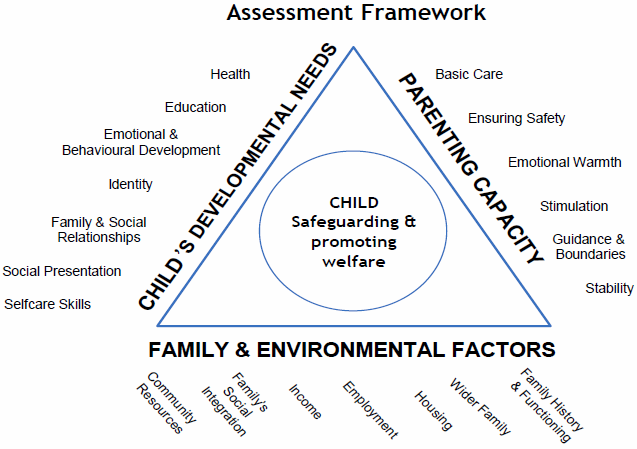 Assessment should be a dynamic process, which analyses and responds to the changing nature and level of need and/or risk faced by the child from within and outside their family. It is important that the impact of what is happening to a child is clearly identified and that information is gathered, recorded and checked systematically, and discussed with the child and their parents/carers where appropriate. Any provision identified as being necessary through the assessment process should, if the local authority decides to provide such services, be provided without delay. A good assessment will monitor and record the impact of any services delivered to the child and family and review the help being delivered. Whilst services may be delivered to a parent or carer, the assessment should be focused on the needs of the child and on the impact any services are having on the child. Good assessments support practitioners to understand whether a child has needs relating to their care or a disability and/or is suffering or likely to suffer significant harm. The specific needs of disabled children and young carers should be given sufficient recognition and priority in the assessment process. The local authority should act decisively to protect the child from abuse and neglect including initiating care proceedings where existing interventions are insufficient. Where an assessment in these circumstances identifies concerns but care proceedings are not initiated, the assessment should provide a valuable platform for ongoing engagement with the child and their family. Where a child becomes looked-after, the assessment will be the baseline for work with the family. Any needs that have been identified should be addressed before decisions are made about the child's return home. 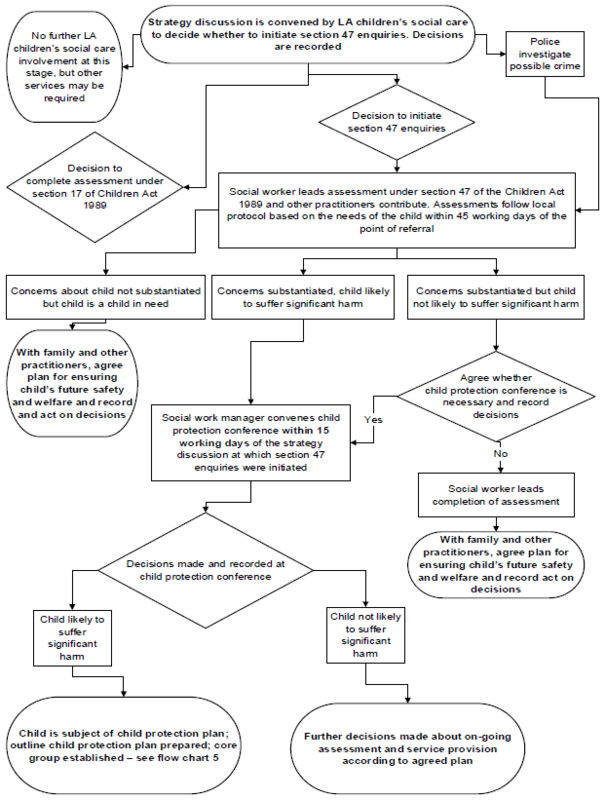 Assessment by a social worker is required before a looked after child under a care order returns home. This will provide evidence of whether the necessary improvements have been made to ensure the child's safety when they return home. Following an assessment, appropriate support should be provided for children returning home, including where that return home is unplanned, to ensure that children continue to be adequately safeguarded. In order to carry out good assessments, social workers should have the relevant knowledge and skills set out in the Knowledge and Skills Statements for child and family social work. Social workers should have time to complete assessments and have access to high quality practice supervision. Principal social workers should support social workers, the local authority and partners to develop their assessment practice and decision making skills, and the practice methodology that underpins this. Are transparent and open to challenge. The impact and influence of wider family and any other adults living in the household as well as community and environmental circumstances. An assessment of the support needs of parent carers, or non-parent carers, of disabled children may be required. Recognised, valued and supported: Next steps for the Carers Strategy (2010). Further information about processes relating to care and court proceedings (including pre-proceedings) can be found in the statutory guidance document for local authorities, Court Orders and Pre- Proceedings (DfE, 2014). Under the Care Planning, Placement and Case Review (England) Regulations 2010. Knowledge and skills statements for child and family social work. An assessment of the support needs of parent carers of disabled children may be required. See Chapter 2 paragraph 30 on adults with parental responsibility for disabled children. Every assessment should reflect the unique characteristics of the child within their family and community context. Each child whose referral has been accepted by children?s social care should have their individual needs assessed, including an analysis of the parental capacity to meet those needs whether they arise from issues within the family or the wider community. Frequently, more than one child from the same family is referred and siblings within the family should always be considered. Family assessments that include all members of the family should always ensure that the needs of individual children are distinct considerations. Where the child has links to a foreign country, a social worker may also need to work with colleagues abroad. Every assessment, including young carer, parent carer and non-parent carer assessments, should draw together relevant information gathered from the child and their family and from relevant practitioners including teachers and school staff, early years workers, health practitioners, the police and adult social care. Where a child has been looked-after and has returned home, information from previous assessments and case records should also be reviewed. A child with links to a foreign country may be a foreign national child, a child with dual nationality or a British child of foreign parents/national origin. Further guidance can be found in Working with foreign authorities: child protection and care orders (2014). The social worker should analyse all the information gathered from the assessment, including from a young carer?s, parent carer?s or non-parent carer?s assessment, to decide the nature and level of the child?s needs and the level of risk, if any, they may be facing. The social worker should receive insight and challenge to their emerging hypothesis from their practice supervisors and other relevant practitioners who should challenge the social worker?s assumptions as part of this process. An informed decision should be taken on the nature of any action required and which services should be provided. Social workers, their managers and other practitioners should be mindful of the requirement to understand the level of need and risk in, or faced by, a family from the child?s perspective and plan accordingly, understanding both protective and risk factors the child is facing. The analysis should inform the action to be taken which will have maximum impact on the child?s welfare and outcomes. No system can fully eliminate risk. Understanding risk involves judgment and balance. To manage risks, social workers and other practitioners should make decisions with the best interests of the child in mind, informed by the evidence available and underpinned by knowledge of child development. Critical reflection through supervision should strengthen the analysis in each assessment. A desire to think the best of adults and to hope they can overcome their difficulties should not subvert the need to protect children from chaotic, abusive and neglectful homes. Social workers and practice supervisors should always reflect the latest research on the impact of abuse and neglect and relevant findings from serious case and practice reviews when analysing the level of need and risk faced by the child. This should be reflected in the case recording. Assessment is a dynamic and continuous process that should build upon the history of every individual case, responding to the impact of any previous services and analysing what further action might be needed. Social workers should build on this with help from other practitioners from the moment that a need is identified. A high quality assessment is one in which evidence is built and revised throughout the process and takes account of family history and the child?s experience of cumulative abuse. A social worker may arrive at a judgment early in the case but this may need to be revised as the case progresses and further information comes to light. It is a characteristic of skilled practice that social workers revisit their assumptions in the light of new evidence and take action to revise their decisions in the best interests of the individual child. Decision points and review points involving the child and family and relevant practitioners should be used to keep the assessment on track. This is to ensure that help is given in a timely and appropriate way and that the impact of this help is analysed and evaluated in terms of the improved outcomes and welfare of the child. Every assessment should be focused on outcomes, deciding which services and support to provide to deliver improved welfare for the child. Where the outcome of the assessment is continued local authority children?s social care involvement, the social worker should agree a plan of action with other practitioners and discuss this with the child and their family. The plan should set out what services are to be delivered, and what actions are to be undertaken, by whom and for what purpose. Many services provided will be for parents or carers (and may include services identified in a parent carer?s or non-parent carer?s needs assessment). The plan should reflect this and set clear measurable outcomes for the child and expectations for the parents, with measurable, reviewable actions for them. The plan should be reviewed regularly to analyse whether sufficient progress has been made to meet the child?s needs and the level of risk faced by the child. This will be important for neglect cases where parents and carers can make small improvements. The test should be whether any improvements in adult behaviour are sufficient and sustained. Social workers should consider the need for further action and record their decisions. The review points should be agreed by the social worker with other practitioners and with the child and family to continue evaluating the impact of any change on the welfare of the child. Effective practitioner supervision can play a critical role in ensuring a clear focus on a child?s welfare. Supervision should support practitioners to reflect critically on the impact of their decisions on the child and their family. The social worker should review the plan for the child. They should ask whether the help given is leading to a significant positive change for the child and whether the pace of that change is appropriate for the child. Practitioners working with children should always have access to colleagues to talk through their concerns and judgments affecting the welfare of the child. Assessment should remain an ongoing process, with the impact of services informing future decisions about action. Known transition points for the child should be planned for in advance. This includes where children are likely to transition between child and adult services. Section 17ZD of the Children Act 1989 and section 1 of the Carers (Recognition and Services) Act 1995. The timeliness of an assessment is a critical element of the quality of that assessment and the outcomes for the child. The speed with which an assessment is carried out after a child?s case has been referred into local authority children?s social care should be determined by the needs of the individual child and the nature and level of any risk of harm they face. This will require judgments to be made by the social worker on each individual case. Adult assessments, for example, parent carer or non-parent carer assessments, should also be carried out in a timely manner, consistent with the needs of the child. Once the referral has been accepted by local authority children?s social care, the lead practitioner role falls to a social worker. The social worker should clarify with the referrer, when known, the nature of the concerns and how and why they have arisen. To see the child as soon as possible if the decision is taken that the referral requires further assessment. Where requested to do so by local authority children?s social care, practitioners from other parts of the local authority such as housing and those in health organisations have a duty to co-operate under section 27 of the Children Act 1989 by assisting the local authority in carrying out its children?s social care functions. The child and family must be informed of the action to be taken, unless a decision is taken on the basis that this may jeopardise a police investigation or place the child at risk of significant harm. For children who are in need of immediate protection, action must be taken by the social worker, or the police or the NSPCC if removal is required, as soon as possible after the referral has been made to local authority children?s social care (Sections 44 and 46 of the Children Act 1989). The maximum timeframe for the assessment to conclude, such that it is possible to reach a decision on next steps, should be no longer than 45 working days from the point of referral. If, in discussion with a child and their family and other practitioners, an assessment exceeds 45 working days, the social worker should record the reasons for exceeding the time limit. Whatever the timescale for assessment, where particular needs are identified at any stage of the assessment, social workers should not wait until the assessment reaches a conclusion before commissioning services to support the child and their family. In some cases, the needs of the child will mean that a quick assessment will be required. It is the responsibility of the social worker to make clear to children and families how the assessment will be carried out and when they can expect a decision on next steps. Local authorities should determine their local assessment processes through a local protocol. The processes for children where there is reasonable cause to suspect that the child is suffering or likely to suffer significant harm (this includes immediate protection for children at serious risk of harm). Where there is a risk to the life of a child or a likelihood of serious immediate harm, local authority social workers, the police or NSPCC should use their statutory child protection powers to act immediately to secure the safety of the child. If it is necessary to remove a child from their home, a local authority must, wherever possible and unless a child?s safety is otherwise at immediate risk, apply for an Emergency Protection Order (EPO). Police powers to remove a child in an emergency should be used only in exceptional circumstances where there is insufficient time to seek an EPO or for reasons relating to the immediate safety of the child. An EPO, made by the court, gives authority to remove a child and places them under the protection of the applicant. When considering whether emergency action is necessary, an agency should always consider the needs of other children in the same household or in the household of an alleged perpetrator. The local authority in whose area a child is found in circumstances that require emergency action (the first authority) is responsible for taking emergency action. If the child is looked-after by, or the subject of a child protection plan in another authority, the first authority must consult the authority responsible for the child. Only when the second local authority explicitly accepts responsibility (to be followed up in writing) is the first authority relieved of its responsibility to take emergency action. Wherever possible, obtain legal advice before initiating legal action, in particular when an EPO is being sought. Related information: For further guidance on EPOs see Chapter 4 of the statutory guidance document for local authorities, Court orders and pre-proceedings (DfE, April 2014). Following acceptance of a referral by the local authority children?s social care, a social worker should lead a multi-agency assessment under section 17 of the Children Act 1989. Local authorities have a duty to ascertain the child?s wishes and feelings and take account of them when planning the provision of services. Assessments should be carried out in a timely manner reflecting the needs of the individual child, as set out in this chapter. Where the local authority children?s social care decides to provide services, a multi-agency child in need plan should be developed which sets out which organisations and agencies will provide which services to the child and family. The plan should set clear measurable outcomes for the child and expectations for the parents. The plan should reflect the positive aspects of the family situation as well as the weaknesses. Where a child in need has moved permanently to another local authority area, the original authority should ensure that all relevant information (including the child in need plan) is shared with the receiving local authority as soon as possible. The receiving local authority should consider whether support services are still required and discuss with the child and family what might be needed, based on a timely re-assessment of the child?s needs, as set out in this chapter. Support should continue to be provided by the original local authority in the intervening period. The receiving authority should work with the original authority to ensure that any changes to the services and support provided are managed carefully. Where a child in need is approaching 18 years of age, this transition point should be planned for in advance. This includes where children are likely to transition between child and adult services. 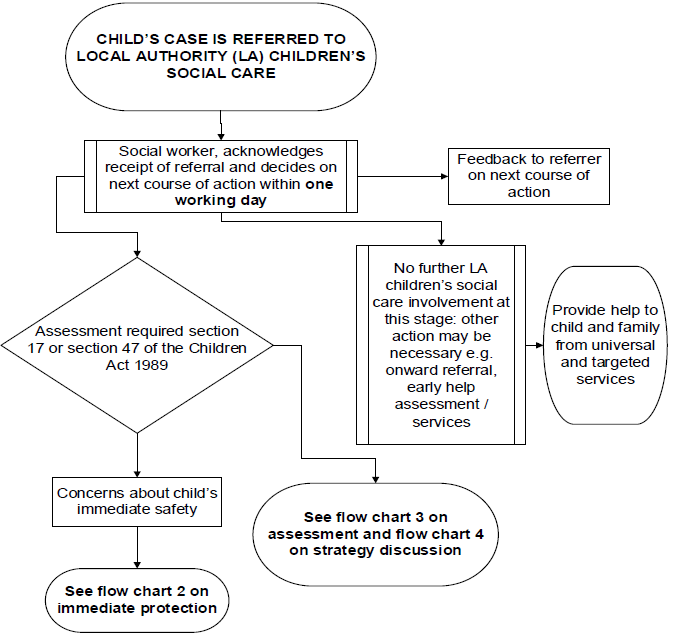 Where information gathered during an assessment (which may be very brief) results in the social worker suspecting that the child is suffering or likely to suffer significant harm, the local authority should hold a strategy discussion to enable it to decide, with other agencies, whether it must initiate enquiries under section 47 of the Children Act 1989. Assessments should determine whether the child is in need, the nature of any services required and whether any specialist assessments should be undertaken to assist the local authority in its decision-making. Inform the referrer of what action has been or will be taken. Assist other organisations and agencies to carry out their responsibilities where there are concerns about the child?s welfare, whether or not a crime has been committed. If a crime has been committed, the police should be informed by the local authority children?s social care. Seek advice and guidance as required and in line with local practice guidance. 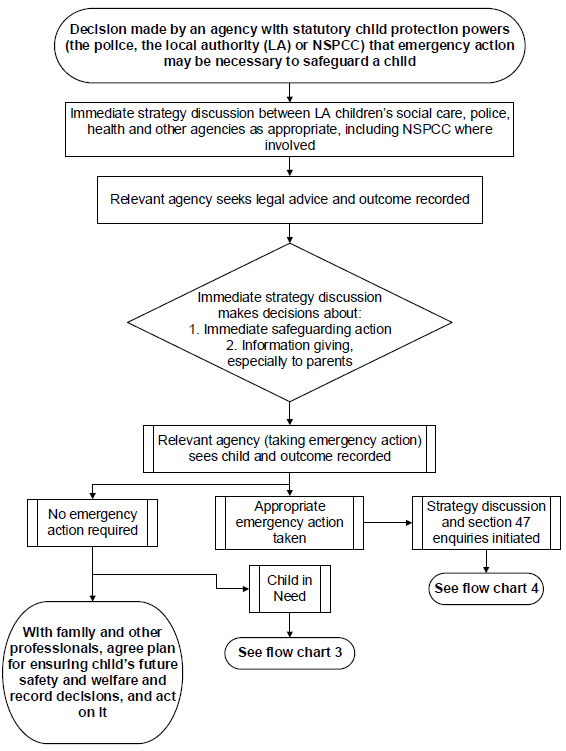 Whenever there is reasonable cause to suspect that a child is suffering or is likely to suffer significant harm there should be a strategy discussion involving local authority children?s social care (including the residential or fostering service, if the child is looked-after), the police, health and other bodies such as the referring agency. This might take the form of a multi-agency meeting or phone calls and more than one discussion may be necessary. A strategy discussion can take place following a referral or at any other time, including during the assessment process and when new information is received on an already open case. Local authority children?s social care should convene a strategy discussion to determine the child?s welfare and plan rapid future action if there is reasonable cause to suspect the child is suffering or is likely to suffer significant harm. Any health or care services the child or family members are receiving. All attendees should be sufficiently senior to make decisions on behalf of their organisation and agencies. Decide whether enquiries under section 47 of the Children Act 1989 must be undertaken. Whether legal action is required. The timescale for the assessment to reach a decision on next steps should be based upon the needs of the individual child, consistent with the local protocol and no longer than 45 working days from the point of referral into local authority children?s social care. The principles and parameters for the assessment of children in need at chapter 1 paragraph 40 should be followed for assessments undertaken under section 47 of the Children Act 1989. Undertake appropriate examinations or observations, and further investigations or tests, to determine how the child?s health or development may be impaired. Lead the criminal investigation (local authority children?s social care have the lead for the section 47 enquires and assessment of the child?s welfare) where joint enquiries take place. A section 47 enquiry is carried out by undertaking or continuing with an assessment in accordance with the guidance set out in this chapter and following the principles and parameters of a good assessment. 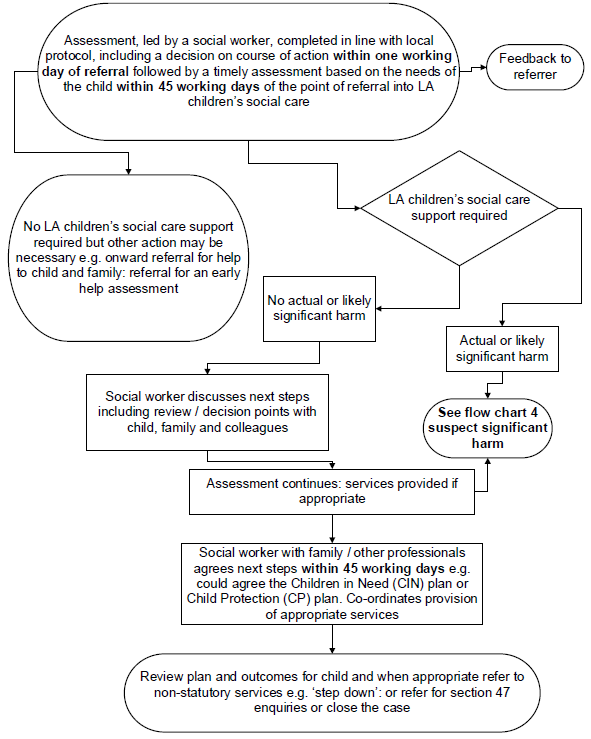 Local authority social workers should lead assessments under Section 47 of the Children Act 1989. The police, health practitioners, teachers and school staff and other relevant practitioners should help the local authority in undertaking its enquiries. A section 47 enquiry is initiated to decide whether and what type of action is required to safeguard and promote the welfare of a child who is suspected of or likely to be suffering significant harm. Follow the guidance set out in ?Achieving Best Evidence in Criminal Proceedings: Guidance on interviewing victims and witnesses, and guidance on using special measures?, where a decision has been made to undertake a joint interview of the child as part of any criminal investigation. Ministry of Justice Achieving Best Evidence in Criminal Proceedings: Guidance on interviewing victims and witnesses, and guidance on using special measures (2011). Follow the guidance set out in ?Achieving Best Evidence in Criminal Proceedings: Guidance? on interviewing victims and witnesses, and guidance on using special measures, where a decision has been made to undertake a joint interview of the child as part of the criminal investigations. Ensure appropriate treatment and follow up health concerns, such as administration of missing vaccines. Local authority social workers are responsible for deciding what action to take and how to proceed following section 47 enquiries. If local authority children?s social care decides not to proceed with a child protection conference then other practitioners involved with the child and family have the right to request that local authority children?s social care convene a conference if they have serious concerns that a child?s welfare may not be adequately safeguarded. As a last resort, the safeguarding partners should have in place a quick and straightforward means of resolving differences of opinion. Consider whether the child?s health and development should be re- assessed regularly against specific objectives and decide who has responsibility for doing this. Help prepare the child if they are attending or making representations through a third party to the conference. Give information about advocacy agencies and explain that the family may bring an advocate, friend or supporter. Following section 47 enquiries, an initial child protection conference brings together family members (and the child where appropriate), with the supporters, advocates and practitioners most involved with the child and family, to make decisions about the child?s future safety, health and development. If concerns relate to an unborn child, consideration should be given as to whether to hold a child protection conference prior to the child?s birth. Agreeing an outline child protection plan, with clear actions and timescales, including a clear sense of how much improvement is needed, by when, so that success can be judged clearly. Monitor the effectiveness of these arrangements. Define the local protocol for timeliness of circulating plans after the child protection conference. The review conference procedures for preparation, decision-making and other procedures should be the same as those for an initial child protection conference. To review whether the child is continuing to suffer or is likely to suffer significant harm, and review developmental progress against child protection plan outcomes. Decide whether to initiate family court proceedings (all the children in the household should be considered, even if concerns are only expressed about one child) if the child is considered to be suffering significant harm. Produce reports for the child protection review. This information will provide an overview of work undertaken by family members and practitioners, and evaluate the impact on the child?s welfare against the planned outcomes set out in the child protection plan. The child has reached 18 years of age (to end the child protection plan, the local authority should have a review around the child?s birthday and this should be planned in advance), has died or has permanently left the United Kingdom. Consider whether support services are still required and discuss with the child and family what might be needed, based on a re-assessment of the child?s needs. This assessment should consider what services and support the child (and their family) might need. The outcome of this assessment should be included in the child?s care plan. The decision to cease to look after a child will, in most cases, require approval under regulation 39 of the Care Planning Regulations 2010. 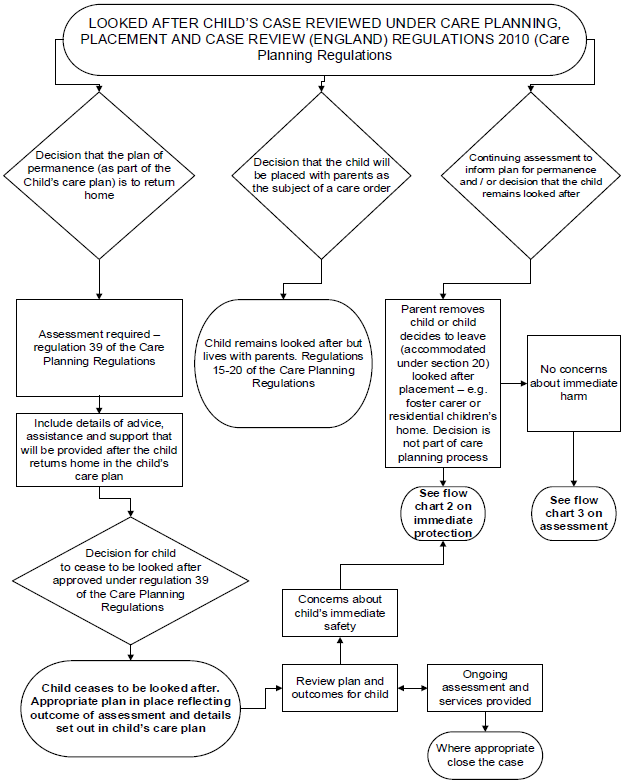 Where a child who is accommodated under section 20 returns home in an unplanned way, for example, the decision is not made as part of the care planning process but the parent removes the child or the child decides to leave, the local authority must consider whether there are any immediate concerns about the safety and wellbeing of the child. If there are concerns about a child?s safety the local authority should take appropriate action, including that the local authority must make enquiries under section 47 of the Children Act 1989 if there is concern that the child is suffering or likely to suffer significant harm. The impact of services and support should be monitored and recorded, and where a child is remanded to local authority or youth detention accommodation, consideration must be given to what on-going support and accommodation the child may need after their period of remand. This should be included in either their care plan or, if remanded to youth detention accommodation, detention placement plan. The Children Act 1989 Guidance and Regulations Volume 2: Care, planning, placement and case review paragraph 8.20.